This Swedish company have a reputation for delivering professional sound quality at a budget price. Do the latest additions to their outboard range measure up? Golden Age distribute high-quality pro audio and acoustics products in their native Sweden. Back in 2009 they started to make their own line of affordable audio gear under the name Golden Age Project (GAP). Almost inevitably, the manufacturing process is outsourced to a factory in the Far East, but these are not simple OEM devices. Rather, GAP design their own products, usually based on classic vintage circuitry, and have them manufactured to their specifications. Several GAP products have appeared in SOS, including a range of affordable ribbon mics, which impressed us greatly, and the Neve-inspired Pre 73 transformer-balanced preamp (/sos/mar09/articles/goldenagepre73.htm) and Comp 54 transformer-balanced compressor (/sos/apr11/articles/ga-comp-54.htm), based on the Neve 2254, both of which met with praise. A peep inside one of the review Pre 73 DLX preamps reveals a couple of the revered — and optional — Carnhill transformers. The DLX variant includes some bonus features and higher-grade components. There's a switchable, inductor-based, high-pass filter at the input, which can be set to 50, 80, 160 or 300 Hz (and can, of course, be switched off). There's also a post-transformer output pad, offering 0, -7, -14, -21 and -28dB options. The former allows you to get rid of unwanted rumbles and thumps, or to take the bottom end out of cymbal mics, for example, whereas the latter enables you to drive the preamp much harder, to coax distortion and saturation effects not only from the mic and line input transformers but also the output transformer. A nice touch, I think you'll agree! There's also a selectable active/passive DI input, the active signal being selectable pre or post the mic-input transformer, and a redesigned power supply, with separate regulators for the audio, LED and relay circuits. Most front-panel switch functions are implemented with relays, and tantalum capacitors have been used in the signal path. The insert also has an in/out switch. Bo also sent me a couple of EQ73s and a PSAC4 power supply, which is capable of delivering enough juice to power up to four GAP preamps and processors. Like all the devices in this range, the PSAC4 comes in a 1U-high, half-rack format. It won't make your gear sound better, but it does mean you can avoid the messy nest of cables that would be inevitable with the standard external line-lump 24V AC supplies. The Pre 73 DLX can accommodate TRS jack or XLR input and output cables, and, unlike the original Pre 73 Mk1, features an insert point that allows the EQ to be inserted into the signal path between the input and output transformers. 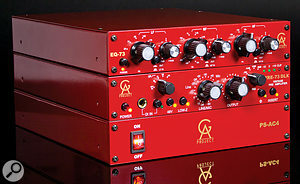 The EQ73 is based on the EQ section of Neve's revered 1073 channel strip, and is pretty faithful to the Neve design. The only real departure is the use of a second inductor for the mid-range band, the idea being to achieve a more suitable response for the two lowest frequencies. There's no need for transformers here, as the EQ is designed specifically to partner the Pre 73 range via the unbalanced insert point — the idea being that you already have the balancing transformers in the preamp, so don't need them here. The two devices are linked by a single stereo cable that carries both the send and return from each unit. Other than the power inlet and a ground lift-switch, that's all there is on the rear panel. On the front, of course, you'll find all the controls, which comprise a frequency knob, a gain/attenuation knob, and an EQ in/out switch for each of three bands, LF, MF and HF. There's also a global on/off button, but there's no global EQ bypass: that function is taken care of by an insert on/off button on the preamp. The frequency selectors are stepped switches, whereas gain/attenuation is governed by variable pots, although, usefully, these do have a centre detent at 0dB gain. The mid-range EQ band is a bell type and the other two are shelves, so if you want a high-pass filter you'll need to look to the DLX preamp (or use a mic with a filter built in). The Q is fixed, as in the original Neve circuit, but that's fine, as this is clearly intended as a tone-shaping tool rather than a surgical instrument. The low band (LF) offers up to ±15dB gain at 20, 33, 55, 100, 175 or 300 Hz; the mid-range (MF) again provides ±15dB, this time at 160, 240, 350, 500 and 700 Hz, and 1, 1.6, 2.4, 3.2, 4.8, 7 and 10 kHz; and the high band (HF) offers up to ±18dB at 8, 10, 12, 16, 20 and 24 kHz. The bands therefore just overlap in a useful way, and extend from 20Hz to 24kHz, making this a very versatile processor. The legending on the front panels of both of these units is clean and easy to read against the attractive rust-red paint. While the knobs work well enough, I can best describe the cases as being rather utilitarian. They're certainly sturdy enough, but the corners aren't rounded and the paintwork can scratch relatively easily when stacking rather than racking these units. However, these devices are clearly intended to push the price of a quality sound as far as is practicable, and I'd much rather the costs were cut in this area than in anything to do with the signal path. The obvious question, then, is what these devices sound like and the answer, just as with all the previous GAP products I've used, is that they sound much better than they have a right to at this price. Whichever transformer options are fitted, both the preamp and the EQ offer a distinctly Neve-ish sound, to my ears. Most people looking for a 'Neve sound' will be anticipating at least some degree of sonic flavouring, but it's important to stress that the degree of coloration you'll get from any preamp is incredibly subtle, and this GAP one is no exception. That said, the Pre 73's functionality means that it's rather more versatile than most. Like almost all preamps, it remains pretty neutral-sounding when you're applying only modest amounts of gain, but one thing that marks the classic 1073 circuit out as being different from, say, API equivalents, is that there's both a gain control and an output-level knob. 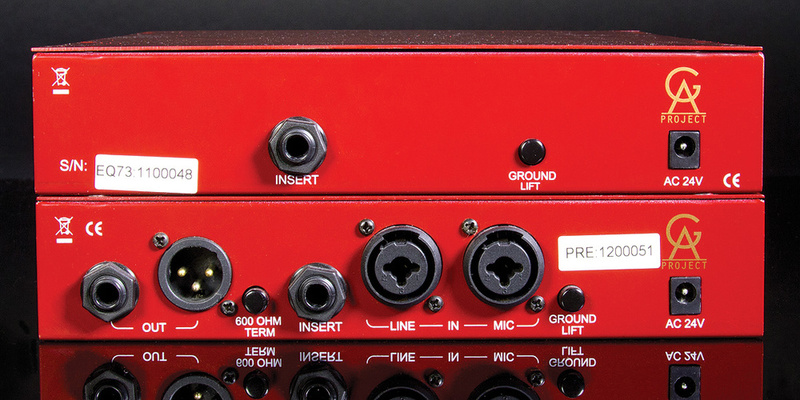 This means you can 'drive' the mic or line input transformers hard and thus increase the contribution the input transformer makes to the sound, while still ensuring that sensible levels emerge from the line output. The post output-transformer pad, though, means that you're also able to independently determine how hard the output transformer is driven in much the same way. By juggling the three gain stages, you can go well past warmth into distortion/saturation effect territory if you really want to. This also means that it's rather easier to compare the sonic contributions of the different transfomer options on the DLX preamp than it is with most preamps. The two do sound different, to my ears, but I'd honestly be hard pressed to say that it was worth spending the extra money for the full Carnhill options. I say that not because there's anything wrong with the fully loaded Carnhill circuit (it's actually very nice indeed, and still competitively priced compared with similar-spec preamps), but simply because Bo evidently spent quite some time finding cheaper transformers that he was happy with in the first place. The Carnhill options take you closer to the pricing of other 1073 clones, and of other nice preamps, so the quality-versus-price factor that makes the Pre 73 different in a crowded market is less striking. I realise that not everyone will agree with me, so the best way I can find to explain the differences is to illustrate them with some audio examples, which you can find at /sos/mar13/articles/GA-pre73DLX-EQ73-media.htm. I'll leave you to make up your own mind whether they justify the extra cost. The EQ, just as I'd expected, is a lovely-sounding tool that adds a gentle touch of character as you boost and cut frequencies, and can be just the thing you need to bring a sound to life. For example, it worked beautifully when I recorded an electric bass via the preamp's DI input, just massaging the sound to take out a bit of 200Hz boxiness, and add fullness lower down. But it's much more versatile than that: I also used it to good effect on vocals, to bring out the breath and 'air', and on electric guitars, to add a bit of attitude. Perhaps this is to be expected of a vintage Neve-inspired inductor EQ, but it's to GAP's credit that they've managed to deliver it at this price. The one disappointment for me is that there's no option for a balanced, stand-alone version of the EQ, which could be partnered with other processors, without the need for the specific preamp. This is how a lot of people like to work these days, adding outboard processors to their DAW via line-level I/O on their audio interfaces or converters, but it didn't work when I connected the EQ via an insert 'Y-lead' to my audio interface at line level, for example. I suspect it would work with other Neve-based designs, but I'd love just to be able to use the EQ alongside my DAW. I suppose the counter-argument is that with all the balancing and level-matching to sort out, you'd be building half the preamp again — so why not just buy the preamp too? If I were to be more critical, I'd also suggest that stepped pots for each band's gain/attenuation controls would make recall of favourite settings rather easier, but in reality the stepped frequency settings are more important, and I'd rather pocket the cost savings, there being pricier alternatives on offer from other manufacturers if you consider such things important. You can get hold of cheaper preamps, but very few that are transformer-balanced, and fewer still that offer the high-pass filter, and the high-impedance input that always seems to get the best out of dynamic mics like the SM57. When it comes to the EQ side of the equation, there are certainly more versatile and clinical EQs available for less, but they don't come close to sounding like this. 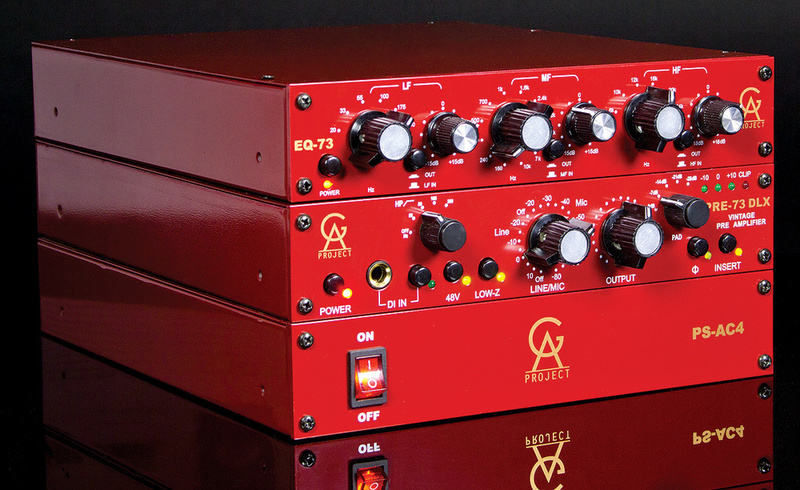 All in all, then, I'm happy to give this pairing of preamp and EQ a big thumbs up. It sounds great: far, far better than anyone would expect of devices in this price range. The 500-series format offers plenty of 1073-style preamps and EQs, not least GAP's own takes on the Pre 73 and EQ73 (I wouldn't be surprised to see a version of the Comp54 compressor follow too). Also in 500-series format, you could look at offerings from Audio Maintenance, BAE, Sound Skulptor and Neve themselves, and many, many more! If you're looking for a stand-alone device, almost all Neve-based designs, whether built by Neve or others, are rather more expensive than the GAP offerings. That may be justified by factors like build quality, design tweaks and after-sales service, but if you're on a budget, the GAP units are pretty much the only Neve-ish game in town. If you open up the comparison to transformer-balanced preamps more generally, there's rather more competition, notably Warm Audio's WA12, a very similar looking design that's based on the API312. Neve-ish sound on a relatively shoestring budget. Both products are great value for money. 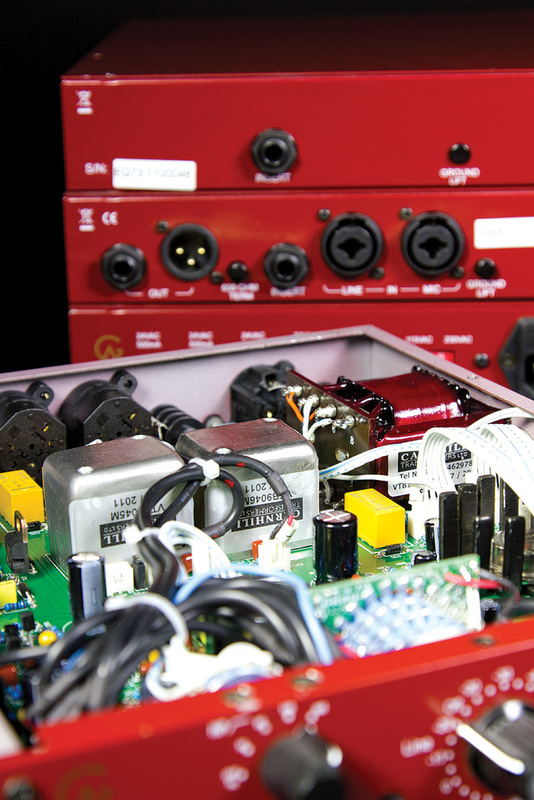 Carnhill transformers are an option on the preamp — pay for it only if you want it. 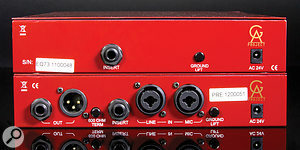 No stand-alone balanced EQ option. Bigger on sound than aesthetics, this transformer-balanced preamp and EQ combo represents good value for the home or project studio owner on a budget, and will easily hold its own in a professional environment. It's a great front end to any DAW, and a pair of preamps would make a good partner for a passive summing amp. Pre 73 Mk II (with standard transformer; Carnhill cannot be fitted) £239; Pre 73 DLX: with standard transformers £349; with Carnhill mic input and output transformers £499; with mic and line input and output transformers £549; with mic and line input and output transformers and high-pass inductor £599; EQ73 £199; PSAC4 four-way power supply £99. Prices include VAT. Pre 73 Mk II (with standard transformer: the Carnhill can't be fitted) $349.99; Pre 73 DLX with standard transformer $449.99; Carnhill transformer mod $225 (from Zen Pro Audio); EQ73 $299.99; PSASC4 four-way power supply $119.99. Rad Distribution +1 914 523 5247.